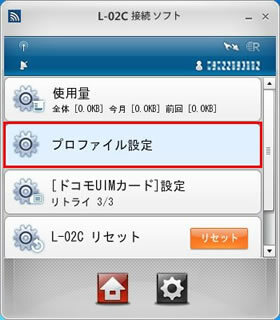 After you install the tanmatsu doraiba (terminal driver) and the LO2C setsuzoku sofuto (LO2C connection software) from NTT docomo's CD-ROM into your computer, please launch the LO2C connection software and configure it to make an Internet connection with your Asahi Net User Name and password. 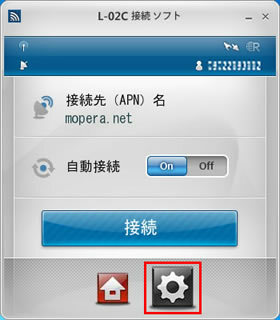 After installing the LO2C connection software it will automatically attempt to connect to the Mopera service - please cancel that and then continue with the configuration below. 1. 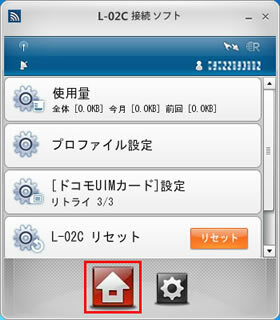 Launch the LO2C connection software. It can be found either in your computer's Start menu or on your computer's desktop. 3. Click on Purofairu Settei (profile setting). 4. Enter the following, and then click on the Settei (apply) button. 5. You will be asked if you want to save the profile. Click the Hai (OK) button. 6. You will be told the profile has been saved. Click the Hai (OK) button. 8. 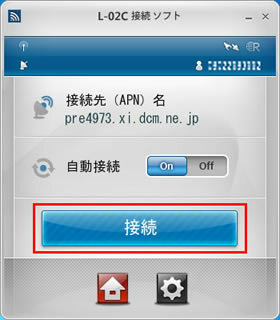 Confirm the displayed Setsuzokusaki (APN) Mei (APN Name) is pre4973.xi.dcm.ne.jp then click the Setsuzoku (connection) button to connect to the Internet. Thank you for visiting the [Xi Service Windows Configuration Guide : Asahi Net : Internet Software Guide] page of Asahi Net, the Internet provider.